Photo: The Correspondence of W.E.B. DuBois, Vol I Selections, 1877-1934; Aptheker, Herbert, Editor; University of Massachusetts Press, 1973. The exact date of the following letter is in question. It may have been written in 1911, but we wanted to share it as it is a touching letter from a father to a daughter and references W.E.B. DuBois' recollections about his visit to Niagara Falls (perhaps during his stay in the area for the Niagara Movement Meeting as members of the group took an excursion to the Falls before adjourning their meeting). Of the things, my little girl must see, one of the wonderfulest is Niagara. It lies in the North where a river wandering swiftly through low meadows parts in two and each part comes in a great cliff where it must leap. The smaller part hurries on before with waters that hesitate, cream and curdle and at last in one small and almost innocent silence leap sheer. They grow white with fear, they tremble and ruffle as they fall and then as they strike on the cruel rocks ___ feet below, the smoke and sweat of their pain rolls up and their voice comes in a great quiet roar which for want of words we must call mighty. You cannot, however, really see Niagara in the United States - where indeed you may touch it in impudent familiarity; but to see it truly, hurry across the iron bridge into Canada and seat yourself in the park quietly. Then raise your brown eyes to the heavens - they will best be blue and grey with cloud flecks; below will lie trees and leaves, green crimson-tinged as I see it now. In front is the wide and hurrying river, rainbow tinted and exhausted, while between sky and river roars the greater Niagara. This fall is grander and mightier. Its roar is as a silence beneath the noise of the other. Far up the river the waters begin to fret and fume and seek escape - they churn and rush and whirl - they sense the awful cataclysm and the terror of it is on them. Suddenly beneath them there is nothing - the foundations of earth give way; in one great green and weltering mass the waters drop. For a mad moment they hang between heaven and earth and about the central abyss throw great appealing arms. The thunder of the End is in their ears. They plunge. But upon the awful mystery of that inner, deeper, wilder fall no human eye may look. Its frightened bloodless face is veiled. Vast sheets of mist roll up and with wild white hands screen this sanctuary of Almighty God, while this, the pale waters churning and foaming shines His shadow below in silent rainbows. The Papers of W.E.B. 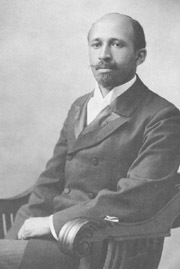 DuBois, 1877-1963.